I really enjoy working on cars. Really, I do. No, I mean it. And sometimes I’m even good at it. At least I think I am. Maybe? Even after the lunacy that is the saga of the timing chain and turbo rebuild on my Mini. It’s a project that took about 10 times as long as it should have, and cost twice as much as I expected, and ended with me turning to the dark side and bringing the car to... the dealership. For service. At 140 American Dollars Per Hour. But, at least it was more successful than my last project. Good riddance to that hulking pile of scrap. At least I came out the other side of this one with my sanity mostly intact. Although I was close there, for a while, to losing it. Ugh. Let me start at the beginning. The beginning sees me sitting in traffic on 295 South near Mount Holly, heading to Alexandria to visit some friends. Blip the throttle to creep along in first, glance in the rearview through a cloud of blue smoke. Crap. Is that from me? That’s from me. My wife is chattering away and I interrupt her and tell her to check the mirror and make sure I’m not seeing things. “Yep, that’s definitely from us,” she says. So I do the old Jersey U-turn (cling to the cloverleaf until you’re heading opposite the way you started) and we take her car down to DC. When we got back home (after a nice weekend of commiserating with my friend about the joys and heartache of German car ownership (and he would know, as he dailies a nice clean e90)) and I drove the Mini around a little bit, I didn’t notice any smoke. So whatever, I was busy. I drove it, it worked fine. If not solved, the problem was at least keeping quiet. A shot of the Mini in front of the old house. Now I’m a little sad. It was a good house. Over the next few months, we sold our house. The market was (and still is) crazy in NJ, and despite being a bitter cold January, it sold 10 days after we listed it. Which didn’t give us time to find a new house to buy (I say that, but we were being obnoxiously picky about what we wanted, so it was partly our fault). So we ended up moving in with my parents until we could find a place of our own, and the Mini’s mischief was forgotten. Until I was pootling home from work in traffic on 195, and I found myself deploying my smokescreen into the windshield of a state trooper’s Crown Vic behind me every time I launched. Which, in traffic, was a lot. How I didn’t get pulled over, I have no idea. But, that cinched it. I kicked my dad’s Jetta out of the garage and settled the Mini in for some diagnosis. A compression test and leak-down didn’t reveal anything like blow-by or bad valve seals, so, being at a loss, I took advantage of the “local” (in quotes because it’s an hour away, opposite the direction from work) Mini dealership and their flat diagnosis fee. $150 later and I had a shiny new report that said my timing chain was loose, that I was losing oil from my oil filter housing, and that they found some play in my turbo shaft. The report also included a $4,000 repair estimate for the chain and filter housing gasket. No estimate for the turbo. Being somewhat of a contrarian, I scoffed at their estimate, saying to myself, “How hard can a timing chain and turbo rebuild be?” And immediately set off to Pelican Parts to buy all my new toys. A timing chain kit, complete with tensioner and guides, new coolant lines and oil hoses, banjo bolts, bolts for the timing chain guides, bolts for the camshaft and crank sprockets, an exhaust clamp, a serpentine belt, oil filter kit, oil filter housing and oil cooler gaskets, valve cover gasket, exhaust manifold gasket, a bucketload of seals and crush washers, and an air filter for good measure. I also eBayed the special tools for locking the cams and crank in place, and for holding the crank while tightening the sprocket bolt. For the turbo rebuild kit, I found myself directed to G Pop Shop in Arkansas. $80 gets you a full rebuild kit with all the seals and bearings necessary for a maintenance rebuilt of your turbo. Much better than $1800 for a new one from Mini. That shiny, clean paint illustrates how far forward the bumper shifts forward in service mode. Doesn’t look like much, but it sure does help. Anyway, I proceeded to lock down the cams with the special tool, and secure the flywheel with the other special tool, and pulled off the timing chain. This freaked me out, as the N14 is an interference engine and a slight mistake could cost me big. “Big” in the form of, “Hey dummy, now go buy yourself a new car, because this one done broke.” I had some issues getting the cams locked down, but eventually the engine was secured and the timing chain was extracted. One nice thing about the N14: the timing chain comes out the top, so there’s no timing cover or cover gaskets to worry about. What can I say, I see the good side of things. The chain, sprockets, and guides all come out as a cassette. Except, of course, for any tiny plastic pieces that have cracked and dropped off into the oil pan. Those do not, in fact, come out with the cassette. With the old chain guides out, I inspected them closely for any broken or missing pieces. Which, of course, I found. Because the guides are made of plastic. Which led me to sulkily order a tube of Loctite 5970 from Amazon (gooped on gaskets seem to be all the rage nowadays) and drop the oil pan for de-sharding. It was probably right about this point in the re-build when we closed on our house. So, about a month after starting, progress on the Mini ground to a halt. It stalled for a solid month, until we were sufficiently moved in to the new house that I felt comfortable taking a break and forging ahead on the Mini. So, fast forward that month, and I’m back in my folks’ garage taking a blowtorch to my turbo. That’s right. The center bearing housing is held onto the compressor housing by friction, from the factory. After 130,000 miles, it’s held together by rust. Apparently. Even my persistence with the torch combined with my truly masterful skills with the deadblow hammer failed to separate the two pieces. 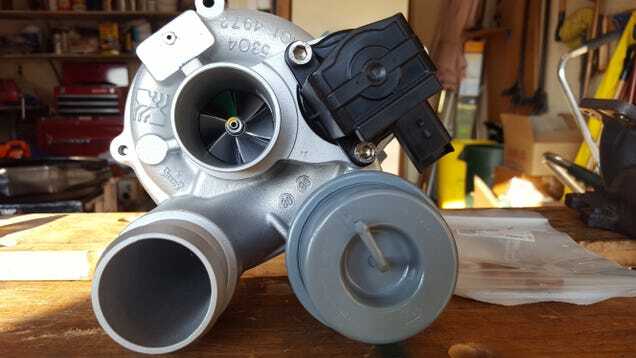 Fearing I’d cause permanent damage if I kept smacking it, I called up G Pop Shop, who were happy for me to send them the turbo and rebuild it for me. Added another $400 to the tab, but it was worth it, as they found that the wastegate (I think it’s the wastegate... it’s a valve thingy inside the compressor housing) was super loose, and were able to bring it back up to spec for me. While the turbo was at the doctor’s, I started reassembling the engine. New gaskets went on the oil cooler and oil filter housing, I checked, double-checked, and triple-checked the timing before putting the crank pulley back on. The valve cover, heat shields, and cat followed, and, when the turbo came home, all shiny and beautiful, it got slapped back on the exhaust manifold with new gaskets, and then buttoned up the front of the engine (really, it’s the side of the engine, since it’s transverse-mounted, and the accessories are all in the wheel-well, but it’s the front of the car, so bleh). Finally, it was time to crank it and see if I had just made an inefficient, expensive bomb, or if I had made a car. First, I pulled the fuse for the fuel pump, unscrewed all the spark plugs, and cranked it to pump oil up through the turbo so the bearings didn’t eat themselves. With a steady stream of oil flowing from the oil return outlet, I re-attached the return line, put the plugs back in, reinstalled the fuse, and plopped back down in the driver’s seat. It was Go Time. With the key in the ignition and my foot on the clutch, I pushed the Start button, and the engine cranked. And cranked. And cranked. I mean, at least it didn’t immediately slam its valves into the pistons, but... Something wasn’t right. Well, to make a long story... oh. Too late. Anyway, to make it a little shorter, I pulled the valve cover off again and rechecked the timing. I also did another compression test, but I really wasn’t seeing anything wrong. In the meantime, another 3 weeks passed, while I simultaneously moved more stuff into my new house and sulked because I didn’t know what was going on with the car. Eventually, I had to throw in the towel, and I called up a number of local Euro-specialist mechanics. Most of whom said, “Wow, you tried to do a timing chain on an N14 yourself? That’s brave.” Then they begged off the job, saying it sounded like too much of a pit to dig out of. So, I fell back on my last resort, the Mini dealership, and with my best ‘hat-in-hand’ voice, asked if they would look at it and tell me what I did wrong. The day after I brought it in, the service adviser called me back and said, “Yeah, there’s a colossal exhaust leak, looks like you installed the exhaust manifold wrong.” So, here’s what I think I did. There are 3 load-spreading bars which go over the flange of the exhaust manifold. Well, being truly brilliant, I put them IN BETWEEN the manifold and the cylinder head. See numbers 6, 7 and 8 down there? They made a lovely, 3/16" gap between the exhaust ports and the manifold, not allowing the turbo to spool up, thereby not allowing the engine to start. The tech also found an intake leak from an intercooler hose that was causing some rough running, but once those two were fixed, the Mini was back in fighting shape! I tend to keep pretty rigorous notes on the parts I buy and how much I spend on them. When I was totaling the receipts from this project, including the rebuild for the turbo, my tab was up to about $1,300. Which, had I put everything back together correctly, would have been a terrific deal for what is, in my eyes, an engine that should get another 130,000 miles on it. Then, when I added in the labor cost for the dealership to fix my stupid mistakes, my project cost doubled. Yep, it was just as much money for Mini to pull the exhaust manifold and reinstall it as it was for me to replace the timing chain and guides, have the turbo rebuilt by a professional shop, and swap out a whole slew of parts in between. A hard lesson to learn, and one I will certainly not forget. I’m told I keep a very clean workspace. By people who have no idea what they’re talking about. I also really can’t complain about the work that the techs at the dealership did. They solved a problem that scared off a number of professional indie mechanics in less than a day. The service adviser I worked with was professional, friendly, understanding - and I’m the stereotypical awful customer who comes in and wants it fixed perfectly for nothing. They really were great to work with, and I can’t argue with their results. I said before that I see the good side of things. Well, the good side to this whole saga is that I actually did successfully replace the timing chain on what is, apparently, a scary engine to do that kind of work on. I really don’t see why... despite my failure, it was a straightforward job which, once armed with the correct tools, I think anyone with average mechanical skills should be able to handle. And, by tackling it (mostly) by myself, it means I get to keep a really, really fun car on the road, rather than selling it for parts or scrapping it because the cost of maintaining it was more than it was worth. Until the electronics start to go. Because it’s all downhill from there, and that thing’s going straight into the dumpster.